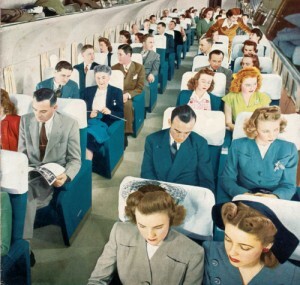 Any time I take an airplane trip—as I did last weekend—I can’t help but play the “Then and Now” game in my head. Anyone over the age of thirty can probably add to the list. Being hijacked to Cuba was a worry, albeit a minor one. Terrorism wasn’t. Before 2001, we never could have imagined security pat-downs or full-body X-rays or being forced to transfer mouthwash and contact lens solution and eye make-up remover and shampoo and sunscreen into three-ounce bottles crammed into a Zip Loc bag. Best of all, back in the good old days nobody was glued to an electronic device. If they even knew what the term meant. In simpler times, there were only a few ways to entertain yourself on a plane trip. Take a nap. Read a book. People-watch. Chat with your neighbor. My daddy always chose that option. He’d come home from a trip and regale us with stories about his seatmates. Where they came from. Where they were headed. What they did for a living. What they liked to eat and drink. What they did for fun. Maybe even how they voted. Since the fruit doesn’t fall far from the tree, I tend to be that way, too. I’ve met some fascinating people on airplanes. I once sat beside a teenager who lived with her grandmother in a converted hangar near a runway in rural Florida. rows behind a man who hadn’t bathed in quite some time. Months, perhaps. Though I didn’t actually talk with him, I did overhear more than a few conversations about him on the long, long ride across the Atlantic Ocean. Nowadays, most passengers wouldn’t even notice such a thing. They’re much too busy doing whatever it is they do with their cell phones until the pilot orders them turned off. Then they’ll put on fancy headphones and flip through the Sky Mall catalog until the plane reaches cruising altitude, at which time they’ll pull out their laptops and become totally immersed in whatever’s on the screen. I once flew all the way from Denver to Nashville scrunched up next to a woman who never said one word until, somewhere over Missouri, she asked me to move so she could go to the restroom. Flying home last weekend, I was determined to make a connection with at least one fellow passenger. I chose my seatmate, a burly New Yorker who looked to be about my age. I broke the ice by asking him if he liked the book he was reading. Turns out he was a sales supervisor for IBM, headed to Birmingham. The timing was bad—he’d had to miss his daughter’s soccer game that afternoon, in which she scored two goals. “Is she a college student?” I asked. “No,” he said, grinning awkwardly. “She’s seven.” I must have looked surprised. “I wouldn’t take a million dollars for her, but I don’t recommend starting a family at age fifty.” We laughed and chatted about that and lots of other stuff and were surprised when the pilot announced we would soon be landing. Which all goes to show that it’s possible to have low-tech fun on a plane ride. Just like in the good old days.